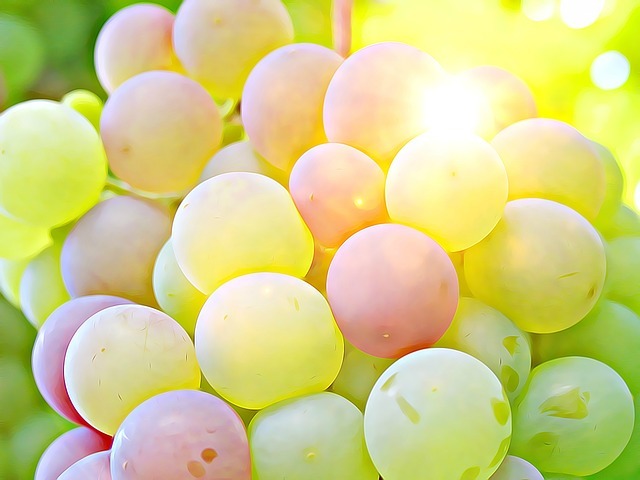 A healthy bunch of grapes! My Dad planted a variety of wine grapes a few years back. The fruit is usually picked clean by the birds. But the vines are doing great and I had fun photographing them for you. 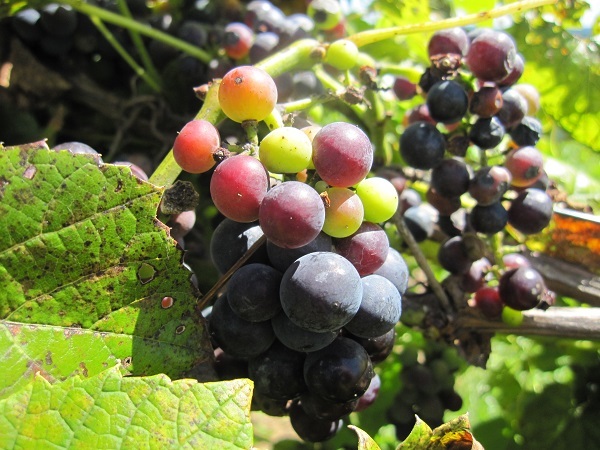 Some of the grapes fall victim to a fungal disease called Black Rot. It causes small yellow spots on the leaves that turn into brown spots. The young grapes will shrivel and turn black, making them look like little grape mummies. You used to be able to purchase copper sulfate for treating the developing grapes. Alas, that same preparation was used to kill all of the algae in ponds by folks who wanted crystal clear water. The unfortunate result was the death of most everything else in those ponds. The suggested treatment now is a chemical called Captan…definitely not an organic option. Copper sulfate was considered a viable organic treatment way back in the day. Perhaps it is best that this concoction isn’t available to the general public. But I wonder about all of the chemicals that are still available, like Captan. What effect does it have on bodies of water and their inhabitants? I’ve read that baking soda helps treat powdery mildew. I wonder if it would be helpful in controlling Black Rot? Have you had any experience with organic controls for this dreaded grape disease? I suppose it couldn’t hurt anything to try the baking soda treatment, along with cleaning up old fruit that falls to the ground, and trimming vines to keep good air circulation around the fruit so that they don’t remain wet…one of the conditions the fungus loves so much. Have you had experience with Black Rot on grapes? What treatment worked for you? I’m sorry to hear that you are having so many issues with your grapes. My vines have all died and I don’t think my Dad is growing them anymore. If I hear anything, I’ll let you know. If you try it, please come back and let us know how it worked. Some of my concord grapes had black rot. Is it safe to eat the luscious healthy looking grapes that have ripened? It should be fine to eat the grapes. If you are concerned, just wash them off with some vinegar and water, then rinse with water. Best wishes! 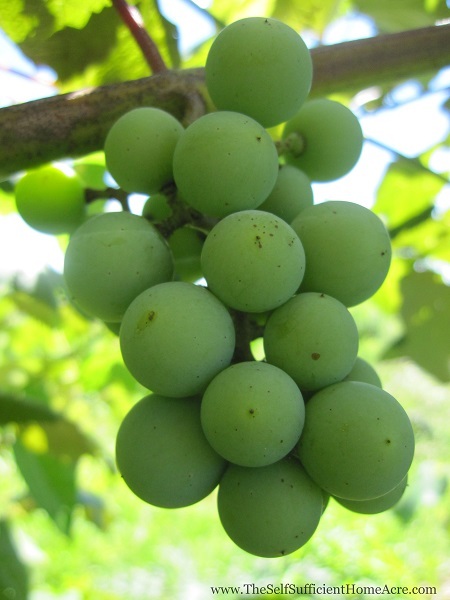 What about making concord wine when only some of your clusters have black rot? Sorry I didn’t see this sooner. I don’t know if the flavor of the wine will be compromised. I think you would want to taste the good ones to see if the flavor of the grapes are different and go from there. Cleaning up the old grapes and leaves is the first line of defense. Also allow for good air circulation to help prevent the proper conditions for the fungus to grow. My Dad wants to try using the acidified copper sulfate that I bought for treating my chickens for large roundworms. It will likely be a year before I know if that works. He can’t buy copper sulfate in New York anymore, but you might be able to in your area. I hope you find a good solution and share it with us too! I haven’t planted hollyhocks in a long time for that very reason. 🙁 Sad, because I love them so. What are you doing for Grape Vines, Lisa,for the last two years mine are not making grapes at all. My grape vines are still young and haven’t started to bear yet. It usually takes 3 years after planting. The ones in the photos are my Dad’s vines. Also, make sure you aren’t piling on too much nitrogen, which will encourage green growth at the expense of flowers and fruit. We have a big green grape vine. The clusters will grow a while and then the whole cluster turns black suddenly and turns to raisins! Is this black rot also or what? It does sound like black rot. Do you have small yellow spots that get bigger and turn brown too? in the past we ignored it. just like tomatoes it is usually there because of the moisture that year and next year will be better or at least different. it has never affected all our fruit either. I think that is what my Dad has been doing, but he has had no fruit survive to eat the last couple of years. He hates to use ‘chemicals’ but he also wants some grapes 🙂 Thanks for stopping by! Sorry I missed the tomato tasting this weekend…sounds like you had a great time! I heard you could use a solution of Hydrogen Peroxide and water. Not sure the ratio, but it helps on tomato plants. It can’t hurt to try the baking soda as well. Good luck. I haven’t tried peroxide…good to know. Thanks! We are grapevine newbies and do not have any actual grapes yet. I don’t have any advice, but do love your photos. There is something so gorgeous about grapes, grapevines, and vineyards.